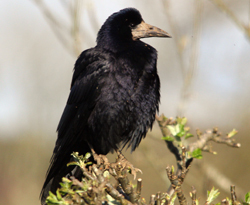 The chough is not the only member of the crow family to inhabit the cliffs of Cornwall. This page gives a brief description of most of the other black crows you may see when out bird-watching. The list is in order of size, from smallest to largest. 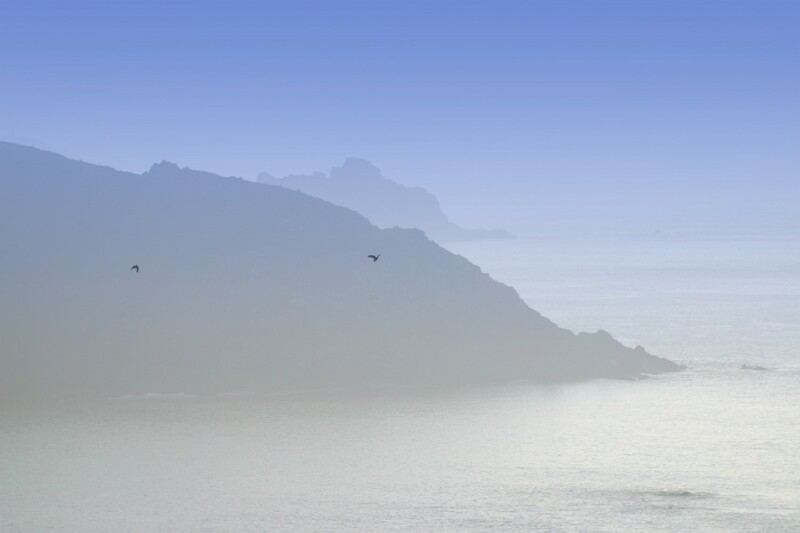 Each bird is shown in a picture as well as a silhouette in flight. There is also a sound clip of each bird, and this can be heard by clicking on the arrow below the silhouette. 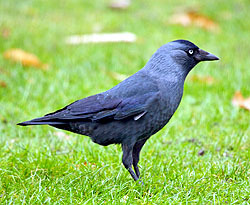 Jackdaws are very common birds in the UK and are particularly common in Cornwall. They are widespread in the county and are equally at home in urban and rural areas. They inhabit cliffs and fields, and can be confused with choughs. The main distinguishing feature of a jackdaw is the silver-grey nape on the back of the neck. Jackdaws also have a very pale eye colour. The call is more like a “chack” than the chough’s “cheow”They are very gregarious birds, forming large noisy flocks at all times of the year. Jackdaws and choughs do compete for the same insects, but jackdaws also scavenge, and take food scraps. The chough is the most splendid of the crows, and is mainly associated with coastal cliffs. It is the only crow to have bright red feet and bill. This is paler in young birds and develops as the birds mature. It is a superb flyer, and is one of the rarest resident birds in England. However, it has larger populations in Southern Ireland, Scotland and Wales. A detailed natural history of the chough can be found here. The rook’s most distinctive feature is the grey-white patch of skin just behind its bill. It is widespread throughout the UK, although less dense in Scotland. 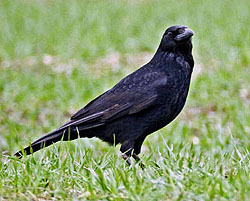 Like many of the crow family, they are very social birds, and are often seen in flocks or small groups in parkland and open fields, hunting for insects and worms, or gathering grain. The rook has an amusing gait when looking for prey, possibly due to the feathers around its legs giving the appearance of a pair of trousers.Rooks may be seen at the coast, but they tend to breed inland, building a large nest of twigs at the top of trees. They nest in large groups – rookeries. The Carrion Crow lives up to its name, often choosing to feed on roadkill. It will eat almost any thing, from food scraps to fruit and seeds. It is the least sociable of the crow family, mostly seen singly or in pairs. It is probably the cleverest of the crows, and is highly adaptable and opportunistic. This allows the Carrion Crow to be the most widespread of the crow family – from mountain peaks right down to the seashore.It has a close relative – the Hooded Crow which has taken its place in Northern Scotland and most of Ireland. The “Hoodie” has grey plumage on its chest and back. It has only been seen in Cornwall once or twice. The Raven is by far the largest and most powerful of the crows in Cornwall. It was once very rare, and almost suffered the same fate as the chough. In the 1970’s it was under severe threat due to the use of pesticides, but it has now made a remarkable recovery. However it’s range is still mostly confined to the western side of the UK. The Raven is among the top predators on the cliff tops, and it is very fond of stealing young chicks and eggs from nests. 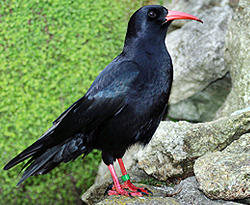 (It has been known to steal chough’s eggs in Cornwall). 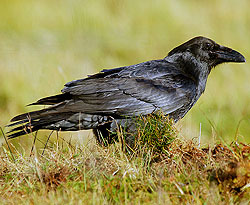 As such a large bird, it is a direct threat to choughs, and choughs will mob and chase Ravens as soon as they are seen.